This is my SECOND Cravebox and granted these are my initial impressions (haven’t had time to USE any of the products yet)! Each month for $10 you get a custom box and a selection of beauty, food, fitness and even more, products. Overall I won’t be using ANY of these products so I’m a bit disappointed. We just recieved our Fitbit’s in the mail so I don’t need the pedometer, I’m counting calories so I’m not using many oils, I already recieve Prevention Magazine on my iPad, and I mainly use Peter Thomas Roth and Clinique products for my face and neck (however I bet my sister would enjoy this product!) so I won’t be using the face and neck toning gel. I think my husband will like the Emergen-C drink mix product and I was super pleased to see that it’s full-sized. 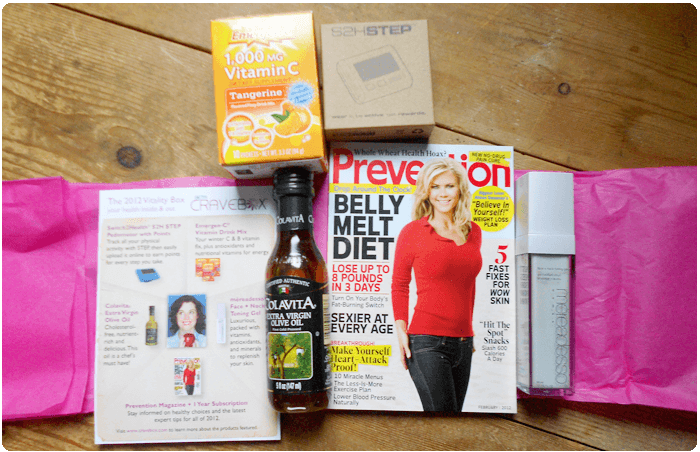 Do you have any experience with any of these products or with Cravebox? By all means, share! I’ve actually looked through all kinds of subscription boxes hoping that there is another one that’ll catch my eye and be worth the price. 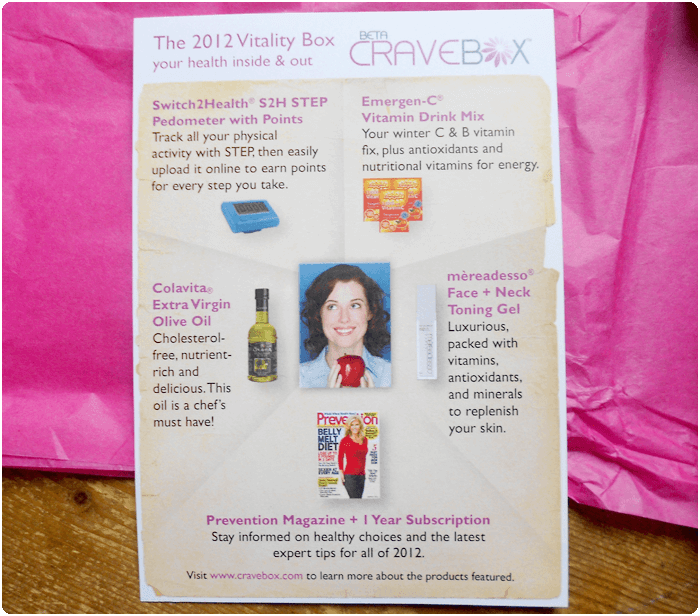 I’ve seen the Cravebox before and has been stalking around to see what’s in it. I feel like Cravebox is a big disappoint for me because after what I’ve seen, they’re not the products I’ll use. I won’t be subscribing to them. If it’s something that you won’t use, I don’t think it’s such a good idea to subscribe. I so far do like the MyGlam and Julep and at least the January Birchbox was MUCH better than previous months but so far I’m not 100% impressed with Cravebox and that’s perhaps just because the products just aren’t geared towards me PERSONALLY but I can see how other people would find them super useful. I’m going to give it one more month. I love MyGlam too. Those products I will definitely use. As for Julep, I actually cancelled after the introductory box because it’s pretty costly. I like their nail polish, but I wouldn’t spend $20 on it every month. I get the ‘It Girl’ box from Julep which usually has 3 polishes so I figure it works out! My box is waiting for me at home and I must say, I’m not impressed at all. The Colavita oil can be bought at any grocery store for $2, the Emergen-C is not something I’ll use–I’m really underwhelmed. I was so excited to subscribe because December’s box looked awesome. I hope February is MUCH better! I’m not exactly pleased either. I’m giving it one more month!